DAS – Direct-Attached Storage: Refers to Local Hard Drives, it’s a storage system directly attached to a server without the use of a storage network between the hard disk drives and server. Examples: SCSI, SAS, SATA, and ATAPI. NAS – Network Attach Storage: Provides both storage and file system to the Server. 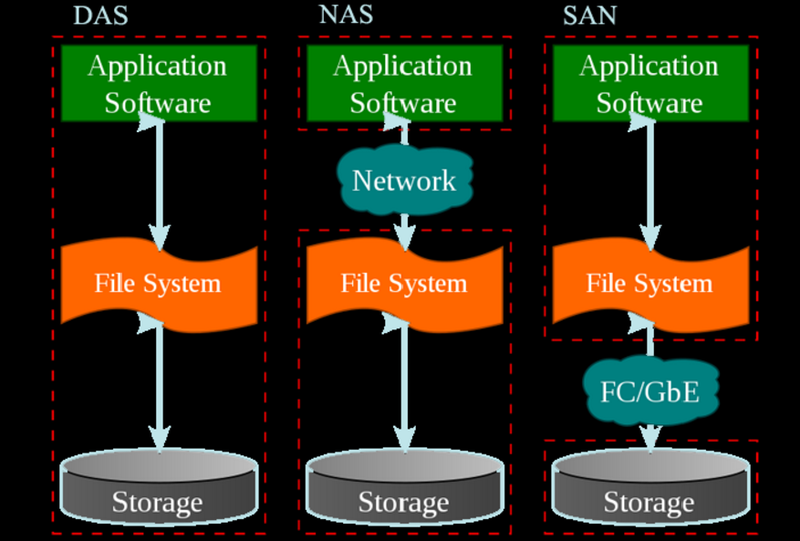 NAS uses file-based protocols such as NFS (Network File System) in a Unix System or SMB/CIFS (Server Message Block/Common Internet File System) in a MS Windows System. SAN – Storage Area Network: Provides only block-based storage to the Server; disk partitioning are done in the server. There’s a storage network protocol between the storage system and the server such as Fiber Channel. In a SAN system, the storage system is call the Target and the HBA (Host Bus Adaptor) is call the Initiator. The storage system presents the hard drives as LUNs (Logical Unit Number) to the server and the LUNs are displayed as physical disks in MS Windows Disk Management or Unix fdisk. Examples of SAN protocols are Fibre Channel, iSCSI, and FCoE.